Barbara is 59 years old today and lives in a small community in the countryside. 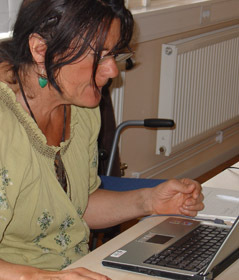 She had hardly used computers when she took part in a MediAbility Digital storytelling workshop in August 2006. She was not really interested in digital communication but she felt she had “A story to tell”. She made her first two minute film and made new friends in the workshop. A few weeks later she decided to join a course to learn how to produce documentary films. Barbara made a digitially edited documentary about a person she had met in the workshop. Barbara joined another MediAbility workshop on how to start your own blog. Recently, she passed our course for training future workshop leaders. Two years after entering the digital society she has initiated a course on Digital storytelling in her local community, where she will be the tutor. Today she uses a computer for information search and emails and she pays her bills electronically. For Barbara, learning about digital storytelling has become a story of empowerment by narration.